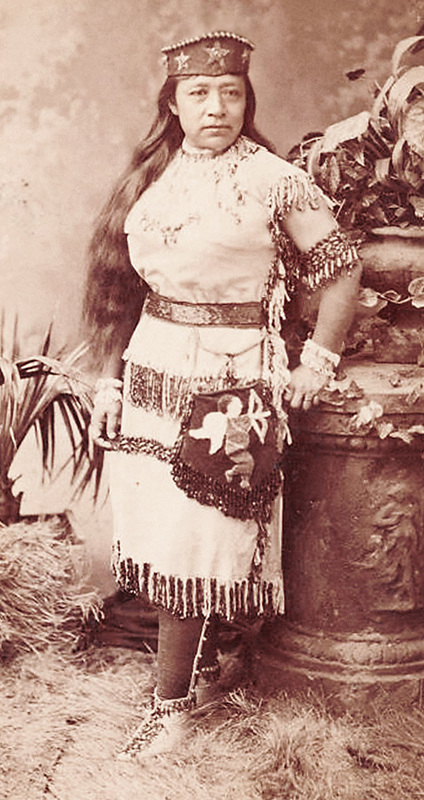 For the first few years of her life, Sarah Winnemucca, who was born around 1844, did not know that she was American. Born Thocmetony (Shell Flower) among the Numa (known among whites as the Northern Paiute or “digger” Indians), she roamed with her people over western Nevada and eastern Oregon, gathering plants and fish from local lakes. But even during her early years, Winnemucca had learned to be afraid of the men with “white” (blue) eyes, who looked like owls because of their beards. For Winnemucca, being “American” was a complicated process of adopting the behaviors and language of people she had reason to distrust. Translating between the two cultures became her life’s work. And though she was uncomfortable with the role, her influence is still felt today: Winnemucca’s autobiography, Life Among the Paiutes, the first English narrative by a Native American woman, voices a thoughtful critique of Anglo-American culture while recounting the fraught legacy of federal lands, including Nevada’s Pyramid Lake and Oregon’s Malheur region, recently the site of a militia takeover. (The 19th-century Malheur Indian reservation lies immediately north of the current wetlands). For most of her life, she sought to straddle American and Native cultures to help the Northern Paiutes. In 1859, land was set aside near Pyramid Lake for a reservation. Winnemucca and her family were expected to abandon their nomadic life for a settled, “American” lifestyle—and make a success of farming in a dry, arid landscape without any training. Many Paiutes died of starvation at Pyramid Lake. They were only given supplies the first year, with government agents pocketing the money intended for them for the following 22 years (a practice common on many reservations). After the first disastrous winter there, Winnemucca was driven to action, begging military leaders at Nevada’s Camp McDermit for help. Wagonloads of supplies were finally sent to the reservation. Winnemucca was hired as a military interpreter and her father and their band moved to the military camp. Translating was a means for Winnemucca to get better treatment for her people, but she was often in an untenable position. In the mid 1870s she had to translate for Agent William V. Rinehart, whom she found to be a hard, unlikeable man. If she translated Rinehart’s words without comment, she failed to protect her people; but if she tried to convey grievances from the Northern Paiutes, she might be (and was) fired from her position. Rinehart eventually banned her from Masher. Winnemucca fared better in the military camps, where her knowledge of Paiute life garnered some respect. In 1878, she worked as a messenger, scout, and interpreter for General O. O. Howard during the Bannock War, a skirmish between the U.S. military and the Bannock Indians. “This was the hardest work I ever did for the government in all my life … having been in the saddle night and day; distance, about two hundred and twenty-three miles. Yes, I went for the government when the officers could not get an Indian man or a white man to go for love or money. I, only an Indian woman, went and saved my father and his people,” she later wrote. Her courageous actions landed her on the front page of The New York Times in June 1878, but sowed mistrust between her and local tribes. The Bannock War ended badly for the Paiutes, who were mostly innocent bystanders. In 1879, military leaders forced the Paiutes who had taken refuge from Malheur at Camp McDermit to march more than 350 miles in winter to the Yakama reservation in Washington territory. Winnemucca was devastated; she had promised the Paiutes they would be all right if they followed military orders. In Yakama she worked as an interpreter. She argued with the reservation agent, wrote letters to military and government leaders, and in the winter of 1880, accompanied her father and other Paiute leaders to Washington, D.C. to meet with the secretary of the interior, Charles Schurz. They succeeded in obtaining a letter allowing the Paiutes to return to Malheur, but the Yakama agent refused to let them leave. Winnemucca escalated her fight for reform. When face-to-face petitions and letters failed to improve conditions for the Paiutes, she began lecturing in San Francisco, dramatizing the plight of reservation Indians. These performances offered a carefully curated version of the “Indian princess” to various white crowds, and she often wore native dress. She told a reporter, “I would be the first Indian woman who ever spoke before white people, and they don’t know what the Indians have got to stand sometimes.” She described the abuses of reservation agents, particularly Rinehart. But her voice came at high cost: Rinehart responded by calling Winnemucca—in public and in letters to the Office of Indian Affairs—a drunk, a gambler, and a whore. Winnemucca became famous. In 1883, sisters Elizabeth Palmer Peabody and Mary Peabody Mann, important educators, intellectuals, and members of the Transcendentalist movement, invited her to lecture in New England. The Peabody sisters also arranged for the publication of Life Among the Paiutes later that year. In all, Winnemucca spoke nearly 300 times throughout New England, meeting John Greenleaf Whittier, Ralph Waldo Emerson, Justice Oliver Wendell Holmes, and Senator Henry Dawes, among others. “The lecture was unlike anything ever before heard in the civilized world—eloquent, pathetic, tragical at times; at others [her] quaint anecdotes, sarcasms, and wonderful mimicry surprised the audience again and again into bursts of laughter and rounds of applause,” wrote a reporter from The Daily Silver State in 1879. She turned her energies instead toward a school for Paiute children, teaching children to read and write in English and providing them with training in marketable skills. Unfortunately, funding for the school was a persistent problem, and in 1887, the Dawes Act mandated that Native children be taught in white-run, English-only schools. And so the school was closed. Winnemucca may have begun her life ignorant of Americans, but by the time she died in 1891, Americans were not ignorant of her—her obituary ran in The New York Times. And if her speeches and writing did not make the changes she hoped for, they remain a vivid, eloquent testimony of a life spent speaking for others. wrote her PhD dissertation on 19th-century women's rhetoric in the American West, including Sarah Winnemucca. She teaches at Southern Utah University and her first novel is forthcoming from Knopf in 2017. *Lead photo courtesy of Architect of the Capital. Interior image courtesy of Elmer Chickering/Wikimedia Commons.